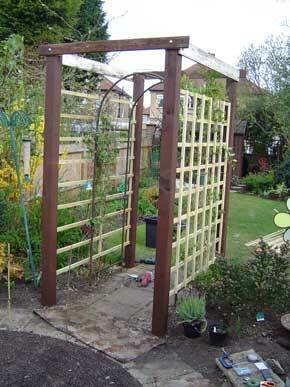 Yet another project we looked at for a while was to replace the archway. We created the original arch from old steel water pipes - my first real welding job. It lasted many years but started rusting through at ground level. 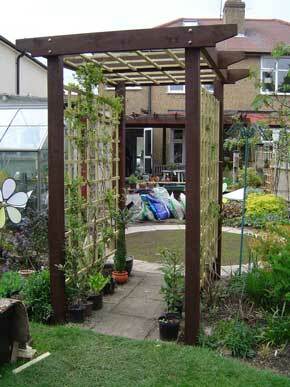 We toyed with replacing it with a proprietary tubular one, but also with a timber one to reflect the pergola. After some thought, we opted for the timber arch as it would offer more of a visual break between the two garden areas (and would be fun to make). 100 x 100 (4" x 4") posts 2.7m high (9'). The cross beam was to be at the same level as the pipe arch allowing 14" of post to go into the ground. The posts are being sanded and the corners radiused. 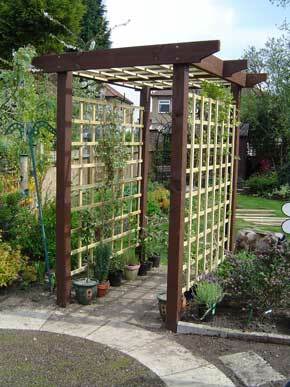 The posts and beams will be treated to match the pergola,but the trellis infills will be left natural. The first post was cast in concrete at the end of one day, just before the rain set in. 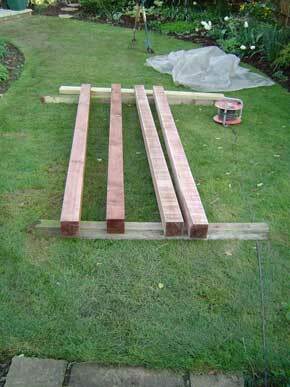 There is only 350mm (14") of post in the ground, but the framework does not require fence post depths. The following morning, the bracing is struck (taken down) and the post stood alone. The other three posts were then erected and concreted in. With the first post already cast-in, the addition of temporary high-level timbers and diagonal bracing the structure was well supported. 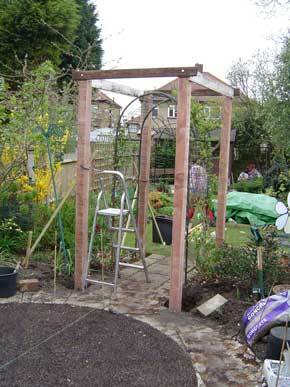 The trellis was purpose made, in-situ. 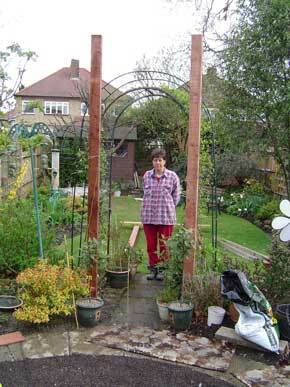 The two climbers (honeysuckle on right and clematis on left) were unwound from the old plastic trellis and retied on the new timber framework. 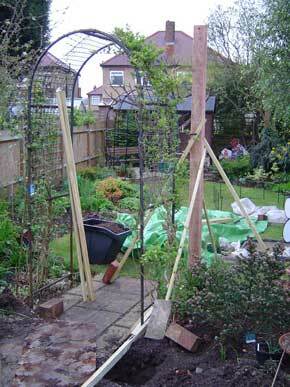 The old steel pipe arch was cut away and the side trellises completed. There was a delay while the rafter timbers were ordered and delivered, but finally, it was complete. 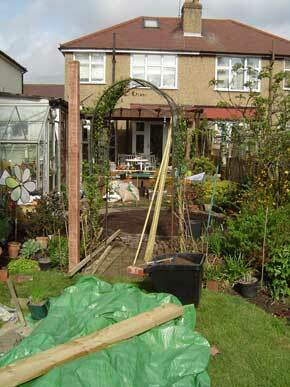 The new arch is far more imposing than the old one and successfully divides the two halves of the garden. At 1.8m (6') long, it is 3 times the length of the old arch and there is plenty of room for more climbers! 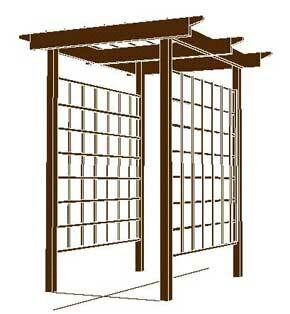 The trellis roof will allow the climbers to create a tunnel to walk through.